Early bird registration for WSRO members. NOW Available until April 19, 2015. 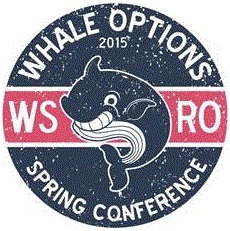 Thank you to all the ETCs, TDM professionals, presenters and guests who joined us at this year's 2015 WSRO Spring Conference, May 4-5 in Ocean Shores, WA. We appreciate you joining us in Ocean Shores for two days of learning, networking, innovations and fun as we contemplated Whale Options - Navigating a Sea of Transportation Choices. We also had a great time during bowling night and an early morning of education on the local beaches. 360-289-4600 - Please contact the hotel directly to make reservations. Please think about joining us next fall in Chelan, WA - exact time, dates and place are still to be determined.